If there is an error in one of the inscriptions then a red aura will be added to the parent object and a speech bubble will show an error message for the inscription. Elements connected to the element with the error, e.g. 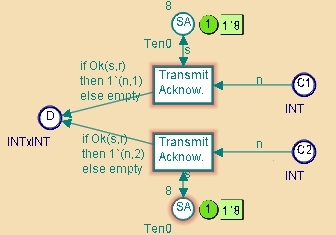 transitions connected to a place with errors, are not checked until the error is fixed. If a place has port tag port and not on the top level page of the CP net or it is connected to a substitution transition but not connected to a port on the subpage the place has an port socket error. This means that it will not be syntax checked. Also any place reachable through port socket assignments of the place will not be syntax checked before the place assignments are fulfilled. That is all places in an assignment chain must be fulfilled before any of the place is syntax checked. Notice the place mentioned is the place of the CPN page which exist on all instances of the page. This means that if an instance of a page has places which are not assigned when they should be, none of the instance of the page is syntax checked. Also pages reachable through port socket chains are not syntax checked. A reddish aura indicates that the ML name of the node is not unique and/or valid. The ML names must be unique in order to use the state space tool. For more information about ML names, see the naming policy.